In February 1987 I got a call from my Investment Banker friend Greg Presson. He had been contacted by Adaptec Inc., a San Jose based company that made SCSI controllers that resided on the peripheral device (SCSI Disk, tape, or scanner for example). They had an eight bit Host Adapter product they designed in 1984 that competed with ours, but it was very poor and they did not have many customers for it. 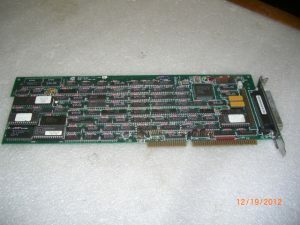 In fact, the Adaptec sales force recommended our product to customers wanting to interface there SCSI controllers to IBM PC XT and AT computers. Adaptec’s bread and butter where disk controllers. Adaptec’s CEO John Adler was interested in talking to us about a potential merger. Adaptec was a public company. I was concerned about sharing our plans with a competitor, but Greg convinced me they were serious. I talked to John Adler and he told me they had no intention of getting into the Host Adapter business. On July 8, 1987 John Adler and several of his people came to our offices in Tustin and spent the day. They were cordial but somewhat skeptical. A week later John sent me a letter saying the Adaptec did not see our business and a large or viable opportunity and thanked me for our hospitality. I wrote him back saying I hoped we could continue to do business together, as by this time Adaptec sales people often recommended our product to interface to theirs. Shortly after our meeting with Adaptec some customers called and told us that Adaptec was sampling a new AT Bus Master host adapter. I was able to get one of our disk drive customers to supply us with the Adaptec AHA-1540 prototype adapter late in 1987. The product had problems; it actually was slower than our 8 bit adapter when the PC was running MS-DOS, the main operating system for PC’s at the time. I called John and asked about the product. He told me that Adaptec saw a need for a high end SCSI Host Adapter that was not being addressed. They designed the AHA-1540 for that market. The product was for high end PC’s being used and servers running UNIX or Novell Netware operating systems. These systems were what is called multi-tasking and Adaptec felt they could get better performance with a Bus Master adapter. Bus Master Adapters were much more complex, and Adaptec was selling the product for close to five times what we were charging. That is where matters stood in mid-1988. In late 1988 one of our customers told us Adaptec was sampling a sixteen bit AT bus adapter that was not Bus Master, it was a low cost adapter designed to compete with our products. Adaptec was going to market their product as superior to ours because it was sixteen bit. We got a copy of Adaptec’s preliminary marketing material, and it was clear they had decided to take the information they obtained during our meeting the year before to develop their strategy and product plans. The lesson I learned was to be far more guarded with our future product plans with potential competitors. Of course those things still happen today, as one can see by the Apple iOS/Google Android story. I felt if Adaptec introduced a 16 bit product before we did it was going to be a major problem for us. Al and the engineering group were working on our sixteen bit product, but were way behind schedule. Al told me he needed more resources to do the sixteen bit product. When we shared product plans with Adaptec we told them our plan was to have a sixteen bit product by early 1989. Our sixteen bit AT bus product was going to be based on technology we developed for the sixteen bit Microchannel (MCA) Host Adapter, the MCS-350 that we introduced in late 1987. Al proposed a single chip adapter that would do both MCA and AT bus. But the product development was stalled. I took the issue to our board of directors, which at that time included me, Al, Herb Evander, and Patty. The board suggested I look at raising capital, and I wrote Al a memo telling him we must had a sixteen bit product no later than July 1989 and that I would raise the capital he needed. In April 1987 IBM announced the new, proprietary PS/2 line of PC’s that use the microchannel bus architecture (MCA). Iomega was the first to come to us asking for a host adapter, followed by others. As a result we had two major host adapter development projects going at the same time, the 950 eight bit host adapter chip which we would manufacture ourselves (up until now we depended on Seagate to manufacture our first chip the 900), the MCS-350 Microchannel adapter. After completing the MCS-350 we began working on the TMC-1800 SCSI host adapter chip for MCA and AT bus. For now, sales of eight bit adapters were very strong. Sales were strong and FY1988 (March) ended with record revenue of $2.5 million and profit of $500,000. By fall we had totally outgrown our suite on Parkway Loop and began looking for more space. We signed a lease on two additional suites in the Parkway Loop complex. This more than doubled our square footage. In October of 1987 we shipped the first MCS-350 microchannel host adapter. IBM did not have a SCSI host adapter for the new PS/2 line of computers so they became interested in us. By now some devices were only available with a SCSI interface, namely certain scanners and optical disk drives, including the new CD-ROM. IBM customers wanted to interface these devices but IBM did not have a solution. IBM began sourcing a limited number of SCSI adapters from us at that time, but in a few years they would grow to be our largest customer. Our OEM sales were increasing rapidly, and so were our Distribution sales. Mike Shaw traveled to Arrow Electronics offices all over the US to build the distribution sales network. Our sales were growing 30% or more a month. I hired Dante Maiorano as VP of Operations to run the manufacturing side of the company. He did a great job and grew with the company.